Meadowlarks have returned to their fence post perches, pastel petals are blossoming on fruit trees and Pasque flowers have sprouted in a carpet of pale purple in local forests. Spring has arrived on Wright’s Mesa. The season ushers in the beginning of fresh seasonal produce, with early favorites like pea shoots, ramps and baby greens on the horizon. But when it comes to peak spring produce, nothing competes with the spindly mascot of the season, that peculiar-looking green stalk that hits its height during these early months. 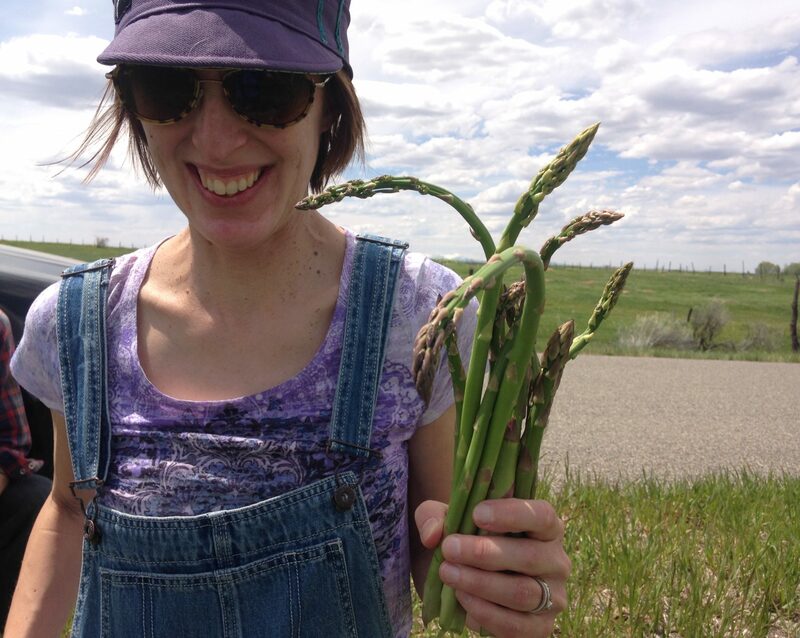 I’m talking about asparagus, the flowering perennial that shines during springtime. This means that grocery stores stock up with quality clusters of the green stems at lower-than-normal-prices right now. But for the lucky denizens of Wright’s Mesa, it also means it’s time to go foraging. That’s because these delicious green shoots, whose folk name is sparrow grass, also sprout up along ditches, under power lines and in the farmlands that spread out all around us — hiding expertly amid blades of grass. And there’s no asparagus more delectable, sweet and herbaceous than the one you’ve just plucked from the earth. Along with being delicious and in abundance, asparagus brings incredible benefits for our health. This water-filled vegetable is low in fat, calories and sodium, and is a good source of vitamins K, B6, C and E along with magnesium, zinc, beta-carotine, folate and potassium. It’s high in fiber and delivers beneficial antioxidants. In addition, asparagus contains high levels of the amino acid asparagine, making it a natural diuretic, which helps the body flush excess fluid and salt. And in the kitchen, it’s enormously versatile. Asparagus can be incorporated into breakfasts, lunches and dinners; eaten as an appetizer or chomped on raw. It’s great oven roasted with a little salt and pepper; mixed into dinner salads with ingredients like chickpeas and hard-boiled eggs; tossed into stir-fries or lightly charred on the grill. It can form the foundation of a cream of asparagus soup, act as the centerpiece of a savory spring tart or shaved into thin ribbons for a crunchy and fresh salad. Asparagus in risotto; asparagus in scrambled eggs and frittatas, asparagus tucked into casseroles. It’s delicious pickled, and some people turn it into pesto. I even like topping my pizza with asparagus. It’s probably pretty evident at this point that I’m particularly fond of this vegetable, but I used to loathe it as a kid and am aware that not everyone is as enthusiastically zealous about it as I am. For those people, I propose a gateway dish: grilled asparagus. Even my asparagus-eschewing father admits that it’s tasty. Fill a large Dutch oven or soup pot three-quarters full with salted water and set it over high heat until it comes to a roiling boil. Add pasta and cook for about 12 minutes or until pasta is just al dente. Pour pasta into colander to drain off water, then toss it with a little olive oil to keep it from clumping. Set aside. Set heavy-bottomed sauté pan over medium heat. Add oil, and sauté garlic about 2 minutes until it releases aromas. Mix in asparagus and red pepper flakes and sauté for 1-2 minutes or until asparagus turns bright green. Pour in stock and cook the mixture, stirring often, just until liquid is mostly cooked off. Add peas, stirring to cook them, and then add pasta, stirring briskly as it absorbs the rest of the broth. Season with salt, pepper, lemon zest and shaved Parmesan. Serve topped with chives.